At Pittcon 2015, Bruker is proud to announce the S2 PUMA bench-top multi-element analyser. The new S2 PUMA is an energy-dispersive X-ray fluorescence spectrometer (EDXRF) for quantitative analysis of the elemental composition of a large variety of samples from pressed pellets, fused beads, powders to liquids and even large and bulky samples. 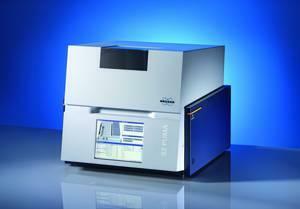 The S2 PUMA complements the well-established S2 RANGER in Bruker’s bench-top XRF product offerings. With the S2 PUMA Bruker introduces HighSenseTM technology for EDXRF. Low detection limits and short measurement times are achieved using a high-power X-ray tube. Best-in-class detection of light elements is realised by the combination of optimised excitation, detection and vacuum mode. Expensive purge gases like helium can be avoided assuring low cost of ownership. The compact and robust design of the S2 PUMA matches the needs of industrial customers in geology, minerals and mining, cement production, metals processing, petro-chemistry and consumer product safety applications. High sample throughput demands are satisfied with either the 20-position EasyLoad™ sample tray or via the automation interface to a conveyor belt. The S2 PUMA is easily integrated into existing or new lab automation systems. Customers with lower sample throughput requirements will benefit from the economic single-loader option of the S2 PUMA. In addition to its perfect fit for industrial applications, the new S2 PUMA is also a very valuable and flexible tool for the academic and research environment because it accepts a wide range of sample types, shapes and sizes. The large flat sample table option accommodates samples up to 16in x 16in (~40cm x 40cm). The measurement spot can also be changed from a couple of centimeters down to a few millimeters to allow for measurements of small spots on the samples. A video camera is provided for exact sample positioning, and the sample image can be saved along with the XRF measurement data and results for easy reference. All users will enjoy the instrument’s ease of use. The S2 PUMA comes with an integrated computer and touchscreen without the need for an external PC. Data input and system operation is intuitive with the multilingual TouchControl™ user interface. The S2 PUMA is equipped with a standard TCP/IP port for extended networking needs, data export and interfacing. Bruker AXS XRF product manager Frank Portala said: "With the S2 PUMA, Bruker offers the most versatile energy-dispersive XRF bench-top spectrometer available on the market. "The S2 PUMA can be optimally configured for high sample throughput, automated measurement processes, large samples, small spot sizes, and state-of-the-art light element detection, all integrated into a robust industrial-grade housing. "Key benefits are the rugged design, the large sample magazine, and the low cost of ownership. Customers responsible for consumer product safety will find the S2 PUMA’s option to measure large products and work pieces non-destructively extremely useful." Image: Bruker S2 Puma analyser. Photo: courtesy of Bruker.